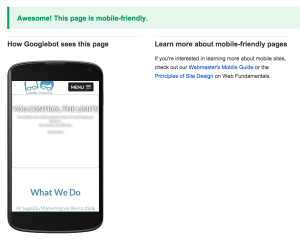 Is your website mobile friendly? Does it have to be? The good news is that this new algorithm doesn’t change how desktop searches rank, however it will change how your website ranks in search engines if using a mobile device. Ask yourself, -cause we did- Do my customers or potential customers use their mobile devices to search my industry? More than likely, your answer will be -YES-. Are My Customers Using Mobile Search To Find Me? 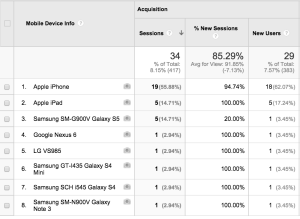 If you aren’t sure, check your Google Analytics data reports to see just how many users come to your site via mobile device. Even if you don’t have the majority of your customers coming from a mobile device search, updating your website to a mobile-friendly site will ensure no revenue is lost and allow for better SEO. This will put you above and beyond your competition or keep you at least on the same playing field. Ready To Make Your Site Mobile-Friendly? We specialize in web design and development and can quickly turn your website into a mobile-friendly site. Ask us how we can help convert your website so you don’t loose potential customers and that you stay competitive amongst the competition. Visit us at www.sageblu.com for more information.